If you’re a frequent traveler, you probably have at least 1 or 2 great travel rewards credit cards in your wallet. You love the ability to earn valuable points that you can turn into flights and hotel stays — plus you love all the perks that can come with some credit cards. It’s only natural that you tell your friends about the amazing benefits you get from this credit card, right? I bet some of your friends have even followed in your footsteps and applied for a card or 2 of their own. Did you know the next time this happens, you can earn bonus points? The American Express Refer a Friend program rewards you each time a friend applies and is approved for a credit card through your link. 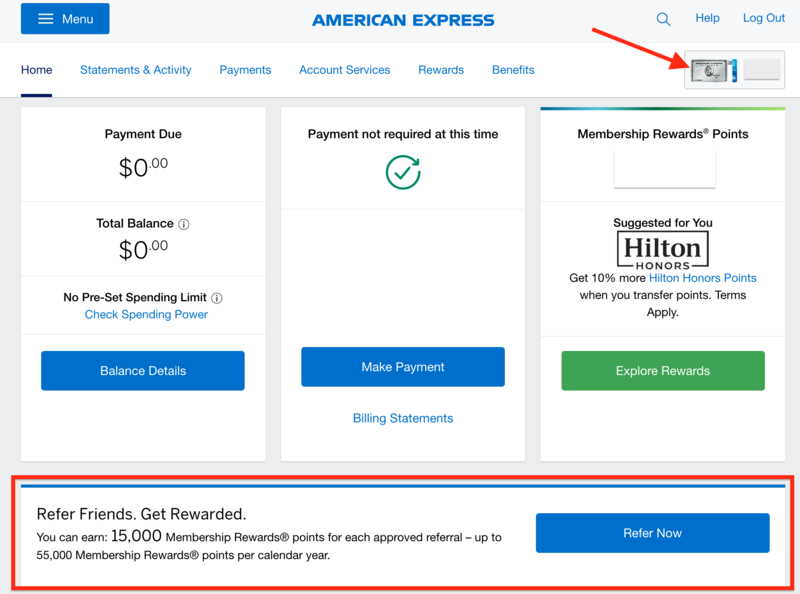 This post will go over everything you need to know: how to use the American Express Refer a Friend program, who you can refer, plus some other tips and tricks to help you maximize your referrals. The American Express Refer a Friend program is a way for you to be rewarded for spreading the word about a particular credit card. You will get a special link to share with your friends and family. When someone is approved for a credit card through that link, you will earn bonus points for your efforts! Referring friends and family to your favorite credit cards is a great way to earn extra Membership Rewards points. 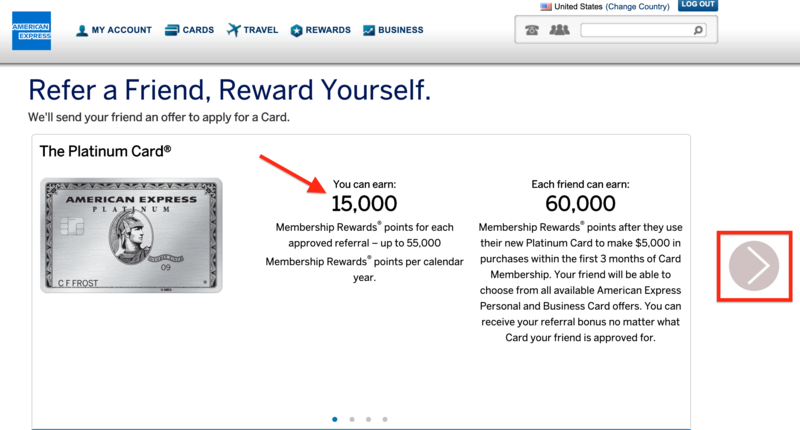 Plus, these refer-a-friend bonuses are available on Amex’s co-branded cards too. However, they also provide links to publish your referral links on your Facebook and Twitter pages. Your friend receives the link but does not apply through the link. Your friend was not approved for the credit card they applied for. Your account is past due — you won’t receive any referral bonuses if you aren’t up to date on your payments. You have reached the maximum number of points you can receive through referrals. Yes, the points you receive from a referral bonus can be taxed. American Express may send you a 1099-MISC, which you are required to file with your taxes. The Membership Rewards points you earn through referral bonuses are valued at 1 cent per point for tax purposes. There are a couple of ways to find the referral links for your American Express credit cards. The most straightforward way to find your referral link is in your American Express online account. After logging in, select the card you want to refer in the upper right corner. Scroll down a bit until you see the referral section right above your recent transactions. Click on the Refer Now button. 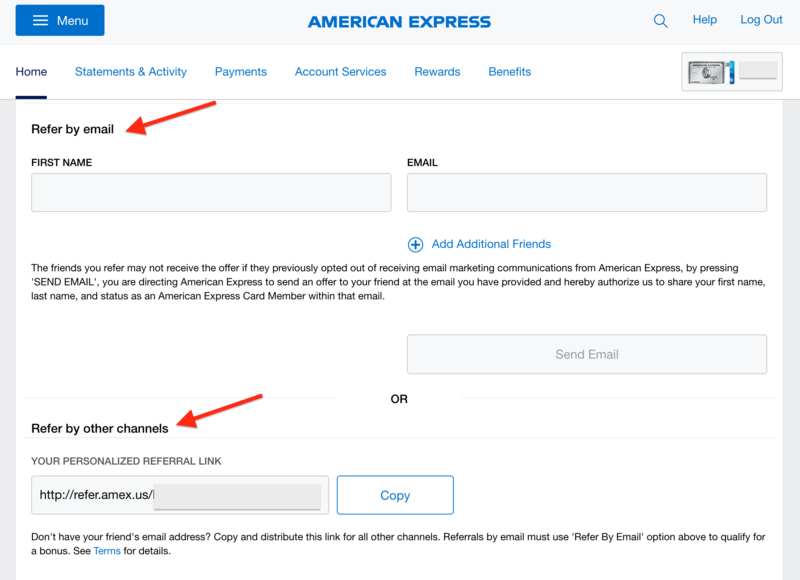 Here, you can enter in an email address and Amex will send a referral email on your behalf — or you can copy your personalized referral link to send out or post on your social media pages. 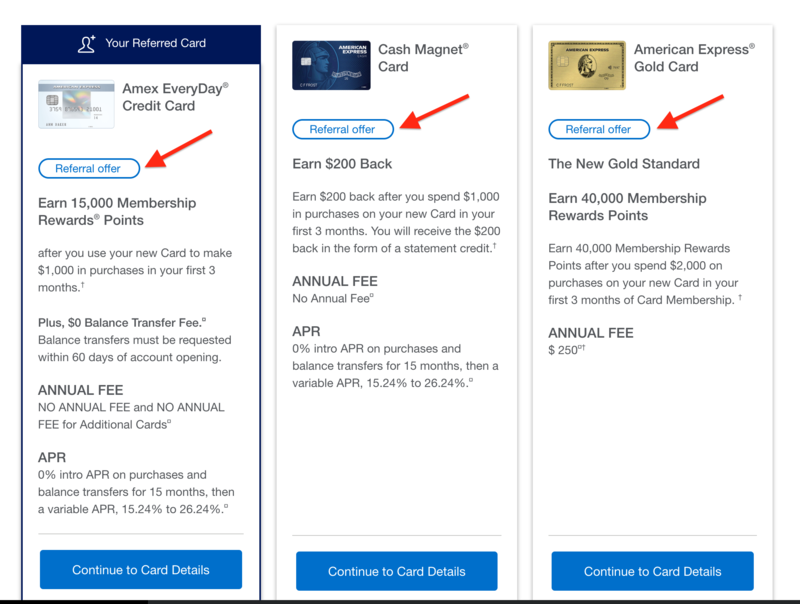 The Amex Refer a Friend landing page is a better option if you want more flexibility with your referrals, since you can easily see all of the referral opportunities you have. You can automatically push your referral links out to Twitter and Facebook, plus you will be able to send referrals for credit cards you don’t personally have. Go to americanexpress.com/refer and log in to your account. Next you will see your American Express credit cards and the referral offers they come with. Scroll through all of your cards using the arrow to the right side of the screen. Once you see the card you want to send a referral for, scroll down to see your options. 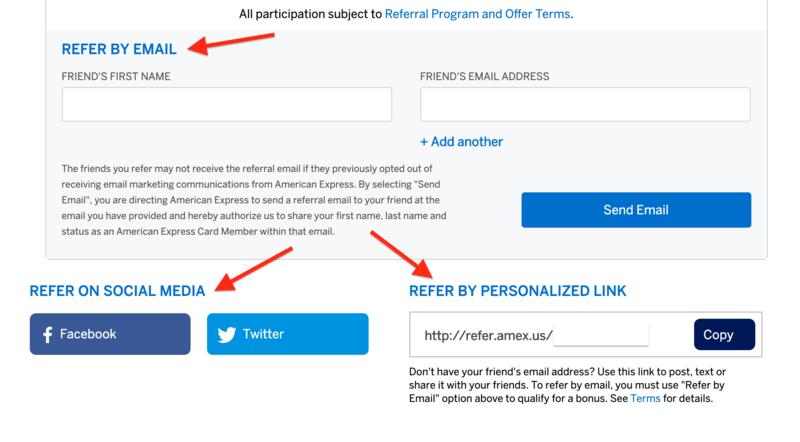 You can refer your friends in 3 ways: an Amex email, social media, or your personalized referral link. Once your friend is approved for a credit card through your referral link, you should see your bonus points within 8-12 weeks. Bottom Line: You can refer a friend to an American Express card through an Amex generated email, pre-set Facebook or Twitter links, or your personalized referral link. Here’s the cool thing about the American Express Refer a Friend program: you can earn a referral bonus for a credit card that you don’t have. This is a nice feature that’s different from the other major refer a friend program offered by Chase. Find your personalized referral link either through your American Express online account or through the Amex Refer a Friend website. Send your link to your friend or post it on social media. When your friend clicks on your link, have them select View all Cards with a Referral Offer at the top left of the screen. They will then see all of the other cards they can apply for using your referral code. As long as your friend sees Referral Offer by the credit card details, you are eligible for a referral bonus. When referring a friend to a credit card you don’t have, it still has to be in the same “family” of credit cards. So, what does that mean exactly? Credit card families are groups of cards that generally earn the same type of points. So, all of the Hilton American Express cards are one family, and all of the Delta American Express cards are a separate family (and so on). 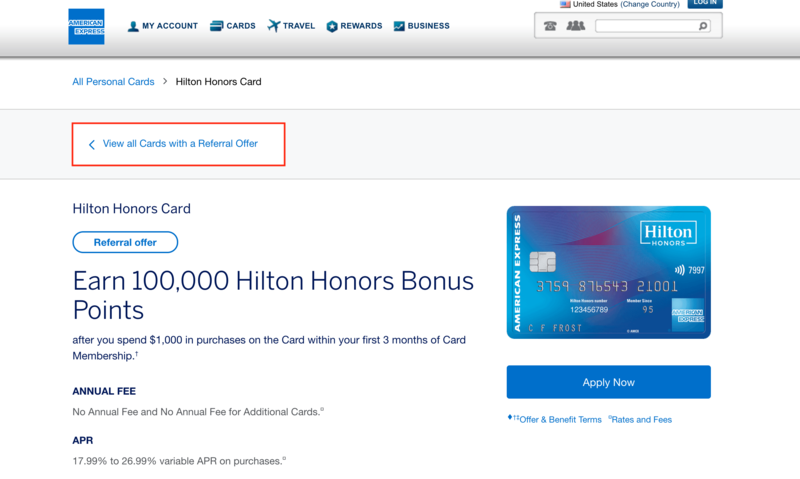 For example, if you have the Hilton Honors American Express card, you can refer someone to that card as well as any of the other Hilton Amex cards — including premium cards like the Hilton Honors American Express Aspire card. But you couldn’t refer someone to the Gold Delta SkyMiles® Credit Card from American Express, because it’s in a separate family. If you are referring a friend to a Membership Rewards-earning credit card, you aren’t limited to only cards that earn Membership Rewards. Bottom Line: You don’t have to have the specific card to refer a friend; you can refer a friend to any American Express card as long as you hold a card in that family of cards. Here are just some of the current Amex Refer a Friend bonus offers available now. These are subject to change and can vary by credit card, so be sure to check your specific offers online. Earn 15,000 Membership Rewards points each time a friend applies and is approved for the Platinum Card® from American Express through your referral link. Earn up 55,000 points per calendar year. Earn 10,000 Membership Rewards points each time a friend is approved for the American Express Everyday® Credit Card through your referral link. Earn up to 55,000 points per calendar year. 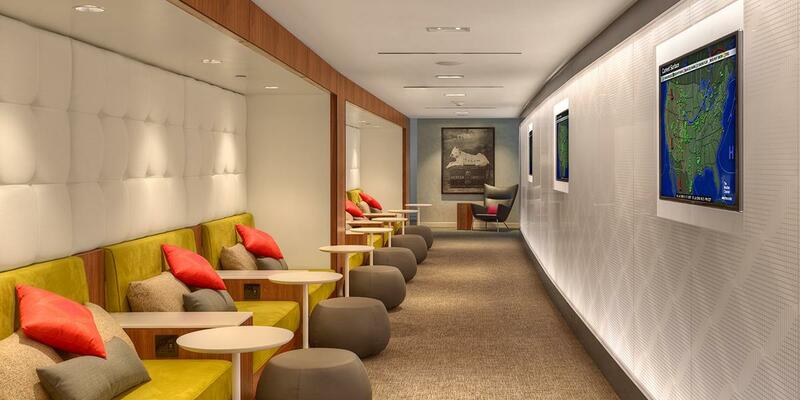 Earn 20,000 Hilton Honors points each time a friend is approved using your Hilton Honors Credit Card referral. Earn up to 80,000 points per calendar year. Earn 20,000 Marriott Bonvoy points each time a friend is approved using your Marriott Bonvoy Business™ American Express® Credit Card referral. 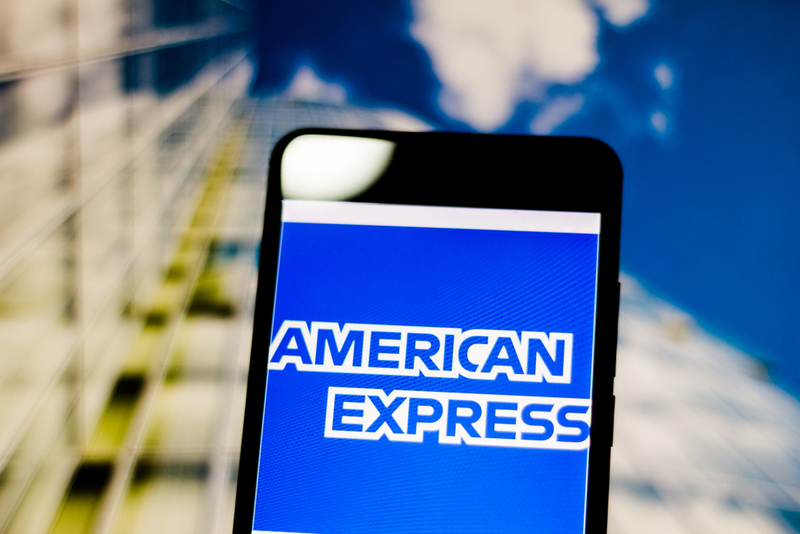 There are also other Amex Cards that may come with a referral bonus. It’s great to know you can be rewarded for sharing your favorite American Express credit cards with your friends. In addition to earning a referral bonus for the credit card you hold, you can also earn a bonus for any card in the same family of credit cards. You can find your personalized referral link online, which you can send out to friends and family or share on social media sites. How long does it take for Amex referral points to post? After a friend is approved for a credit card through your personalized referral link, you should see your bonus points post to your account within 8-12 weeks. How do I refer a friend to Amex? Referring a friend or family member to an American Express credit card is easy. You can find a link to your personalized referral code in your online Amex account right above your recent transactions. Or you can visit the Amex refer a friend website to see all of your referral links. Can I refer a friend to an American Express credit card even if I don't have it? Yes, as long as you have a card in the same family. Families of credit cards are typically cards that earn the same type of points. All American Express Delta cards are in the same family, for example. 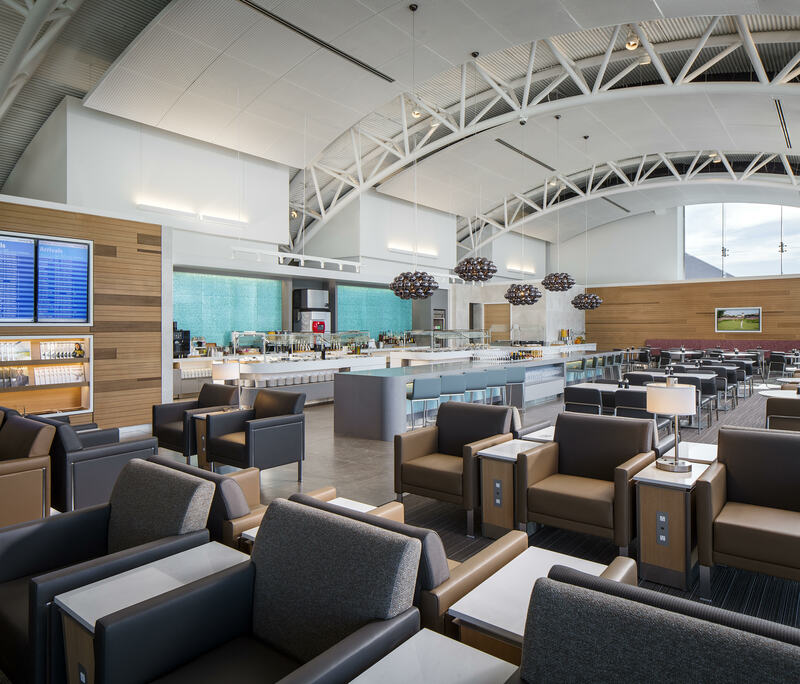 If you have a Delta American Express card, you can refer your friend to ANY Delta Amex card, not just the specific one you have.